Use an exercise band to strengthen your shoulders for a better golf swing. 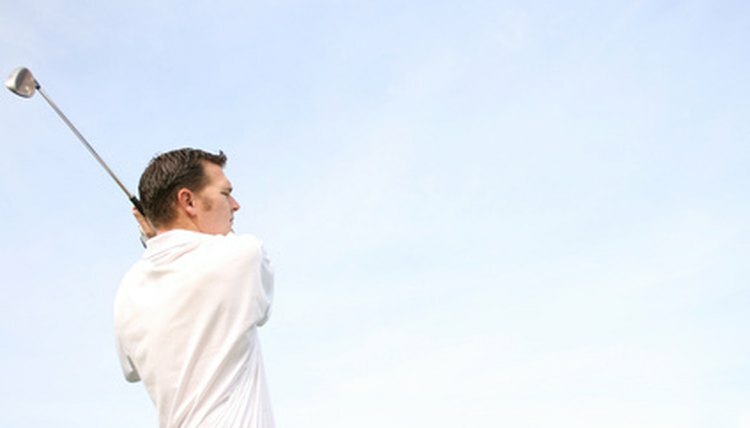 For golfers, the shoulder joint is one of the most important areas of the body. Properly toned shoulder muscles not only help provide a smoother and stronger swing, but also can help prevent common golf injuries. Additionally, the chest is involved in just about every aspect of the game: from swinging and putting to simply bending and maintaining posture. Stretching is important to shoulder exercise. Pro Mann, a professional golfer on the Thailand PGA, says that stretching is the most vital exercise to keep chest and shoulder muscles flexible and healthy. 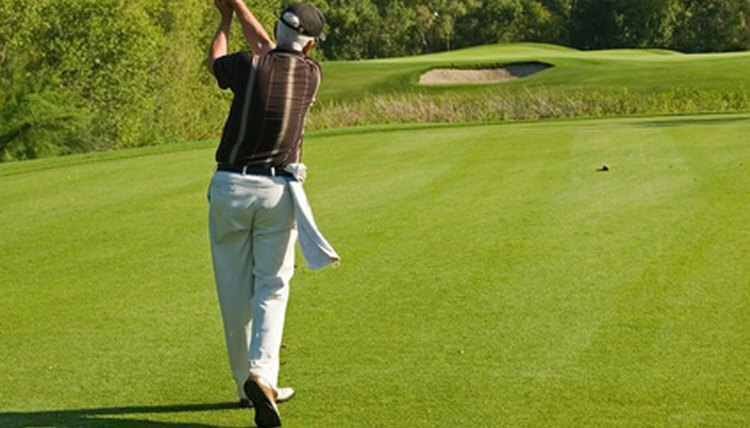 Golfers should stretch at the end of a workout and after a competition, while the body is still warm. Each stretch should be held for 10 to 20 seconds, and bouncing should be avoided so as not to tear or injure a muscle or tendon. Stretching routines should consist of an average of three repetitions and should be performed five times a week. If any pain is present during a stretch the activity should be discontinued immediately. For a good shoulder stretch, intertwine the fingers over your head with your back straight or slightly arched and push up gently towards the ceiling to give muscles just enough backwards resistance. Then clasp your hands behind your back and push out slightly so that the chest receives the same stretching exercise. Pulling exercises are recommended for strong shoulders. Physical therapist Robert Mottram recommends that golfers spend more time doing pulling exercises to build and strengthen their shoulders and chests rather than the pushing movements used in isolation weightlifting and presses. He suggests doing seated rowing exercises to keep the correct posture and avoid injuries, as well as exercises using a cable rowing machine. 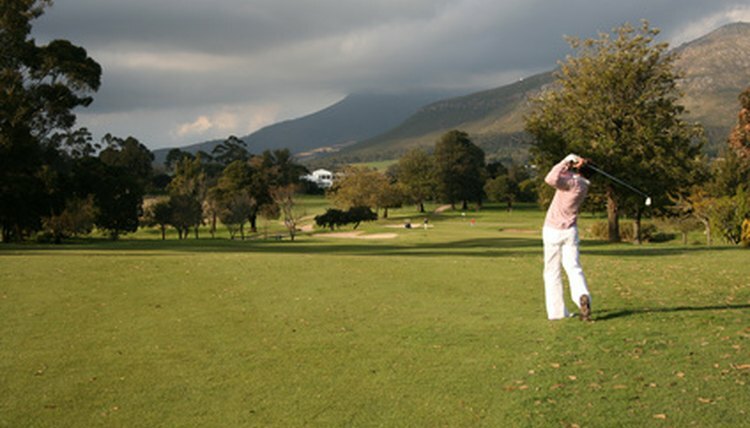 Mottram cautions that since golfing involves the entire body, exercise routines should include leg and torso workouts. Using an exercise band is a good way to improve your swing. Golfers can benefit from workouts involving a three- to four-foot-long piece of exercise tubing, commonly called a Thera-Band. Stand on one end of the tubing and hold the other end, then pull up on the band and bring the arm out in front of the body. Pull slowly to increase strength and build muscles. Release it slowly and repeat the exercise. The tube also can be tied to the floor and used to re-create a golf swing. By pulling the band in a normal swing, the shoulder and chest muscles both should feel the tension. Grab the top of the tubing with the back hand and pull it across the chest. 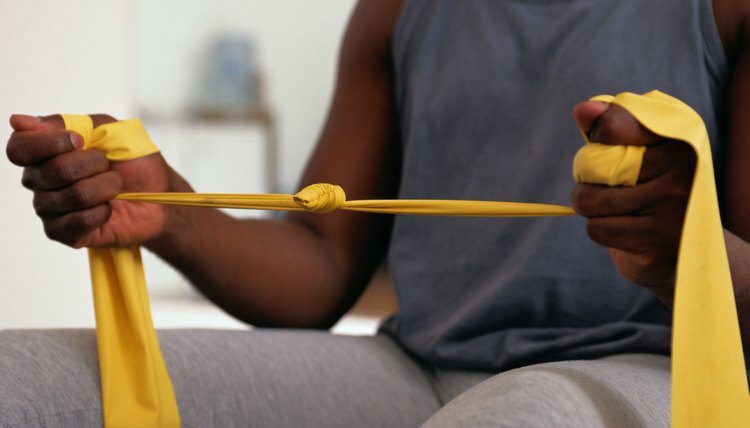 Move and re-tie the tube to a shoulder-high connection and pull the tubing in a downward slope across the front of the body, then repeat it on the other side.